On these pages we'd like to introduce to you our fireworks choreographie software SkyConductor. It offers a powerful set of features designed to aid planning and organizing of professional firework shows. Doing this, SkyConductor is not limited to a single ignition system, but supports many systems on the market today. Support for other systems can easily be added. There are many adapted software solutions on the market today to help planning firework shows. One thing is common to all of them: they are tailord to a specific ignition system-hardware and can only be used with these systems. Although some of them support formats of other programs, you still have to work with at least two completely different programs. Their features will most likely also differ which makes that concept hard to handle. Also, changing to a different system is difficult in most cases because you have to get used to a different set of tools and was of handling your shows. If is not even guaranteed that you can import all of your previous shows into the new software. Also exchanging firework shows between companies is a problem because of the listed facts. In spite of these drawbacks, most of these "isolated applications" almost cost more than the system's hardware itself, which is simply not affordable by many companies. SkyConductor offers a solution to most of these problems. With SkyConductor, you can create shows for many different ignition systems, including nail boards or the old style switch-powered boxes. You can even use multiple ignition systems within the same show and fire your show using all systems simultaneously. This makes it easy to switch systems gradually, exchange shows with colleagues or simply use another borrowed system together with the own ignition hardware if there is not enough capacity available with the own system. The possibility of exchanging shows freely also makes it possible to design fireworks shows as a service. To make all this possible, SkyConductor is equiped with all relevant features needed to help the show designer work on the creative or organizational part of a show. Including feature request from colleagues in the software and our own working experience with it have led to more and more improvements and optimizations. For those working with SkyConductor planing firework shows today is almost reduced to knowing the appropriate effects. Almost all other steps of planing are handled and reduced to a minimum of work by the program. If it's the simple selection of effects for cues, creating step sequences, setting up a show on the screen in 2D (like a map) or the extensive set of reports and labels available for printing, SkyConductor reduces work not only for these steps of the process to a minimum. Pricing is already different from other programs at first glance. 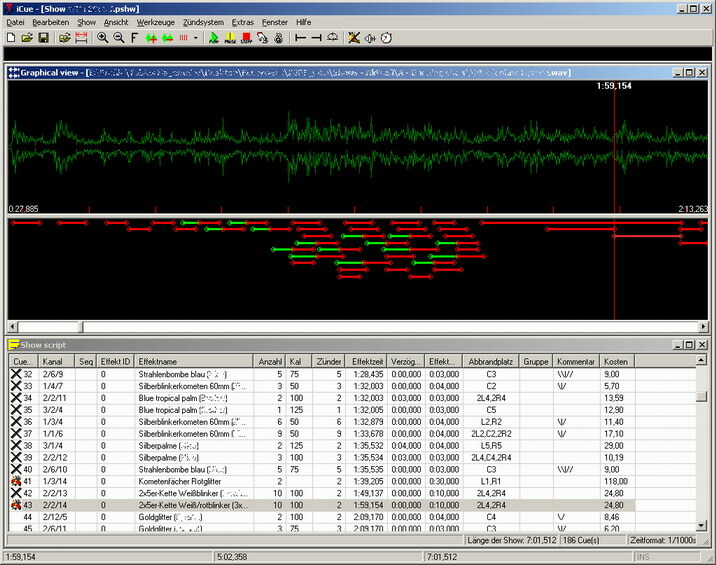 This is mainly owed to the different target group: Where most software solutions target users that can afford a very costly ignition system anyways, SkyConductor was developed with the goal to be an attractive solution also for small companies or semi-professional users which would otherwise not be able to use computer choreographed shows. Because of this, it is also very easy to adapt SkyConductor to less common or home-built ignition systems without any problems. Of course this doesn't mean that you have to accept a smaller set of features, the opposite is true: Using SkyConductor you'll be on the top rung creating and firing firework shows. SkyConductor also supports completely manual ignition systems to the maximum extent possible. Of course you won't be able to shoot your cues automatically but the software helps you to fire your cues manually at exactly the right time. The technique developed by us for this purpose is called EasyTiming. Using this technique, you can even shoot pyromusicals by hand if you leave out complex stepping sequences. Of course you have the opportunity to try out our software. Simply create an user account for the customer's area using the registration link in the navigation menu, we will then unlock your account for the download of the demo version. We would appreciate if you sent us a short note telling us if you liked the program or if you have any further suggestions when you're done testing it.